This week, through Saturday 5/28, ShopRite has the V8 Fusion on sale for $2.50. Plus there are some V8 Fusion Coupons available. 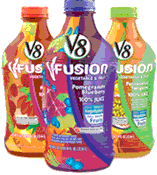 The best coupon is for the V8 V-Fusion + Tea. If that is included in the catalina (which I’m guessing it is), then here is your deal.